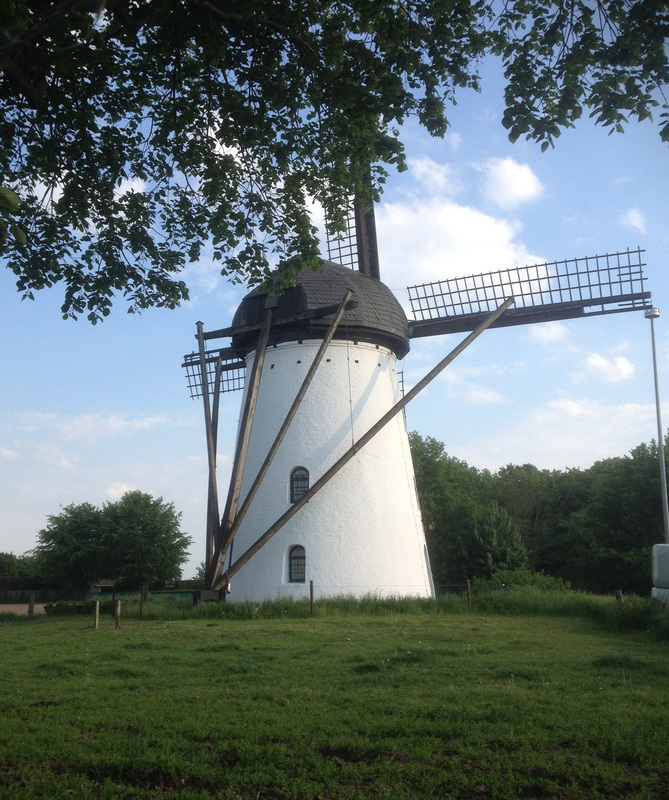 After completing my challenge of visiting all the churches in Kreis Viersen it was time for another challenge – this time all the windmills (old ones, not new wind turbines) and watermills in Kreis Viersen. Fortunately there are rather fewer than the 98 churches – I was able to find 26 mills in total although I expected there might be some more not on lists that I could see (and I am not including other mills that ran on electricity such as the Süchtelner Mühle past which I cycle several times a week). 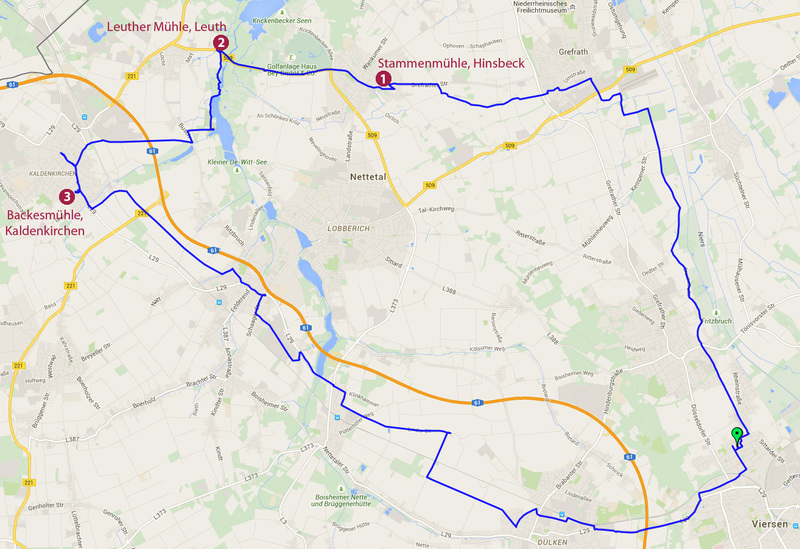 As the first two Mill-bagging rides were from Viersen (riding with Klaus and his family) I decided I would do them all from there, rather than some from Kempen. 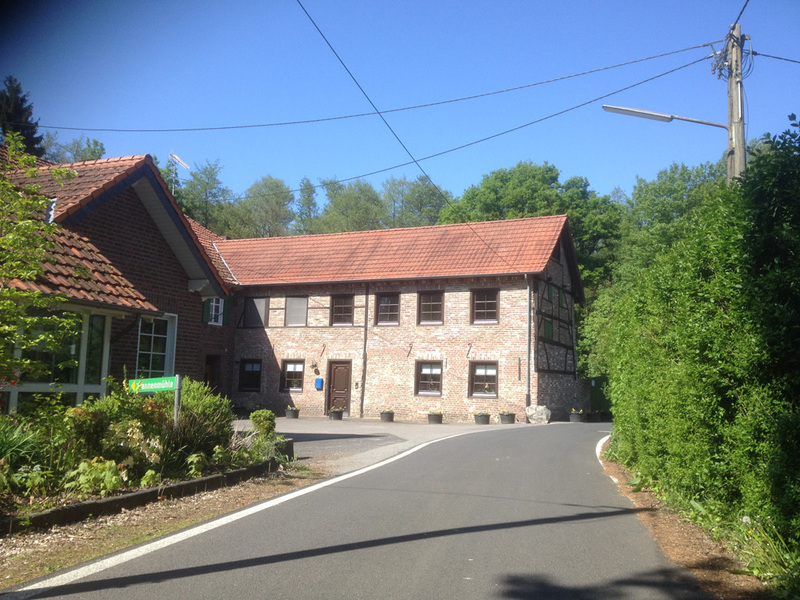 This meant that to visit the mill in St Hubert, 1km from my house, I would end up doing a 40km round trip! 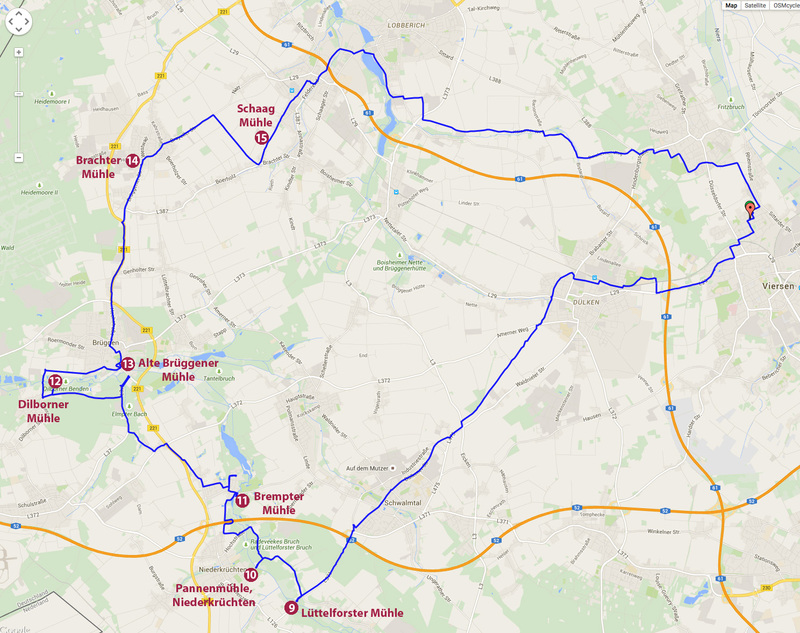 I visited several per cycle ride, and here are the maps of where I went and which mills I saw. A wonderful view down from the Hinsbecker Schweiz hills… with a memorial to the Queen Mother as well! Formerly a restaurant, this has been up for sale for over a year and is looking sadly run down. Now a private house that appears unexpectedly in the middle of a small housing estate. For extra effort I dragged Poppy in the basket for this trip. Klaus and I were also accompanied by Claudia and Lara. I am not sure if my German companions can quite understand why I have to ‘bag’ all these different churches and mills; English eccentricity in action! 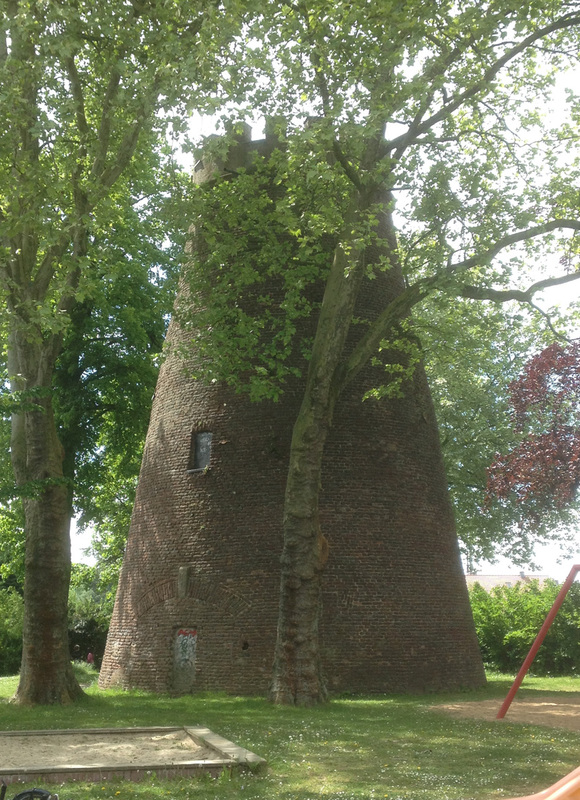 This mill was unexpectedly in the middle of a children’s playground but was looking rather forlorn and unloved. A fantastically popular spot, and as we were there on a public holiday there were people everywhere. Another sad sight – a building no longer in use which is falling into disrepair. 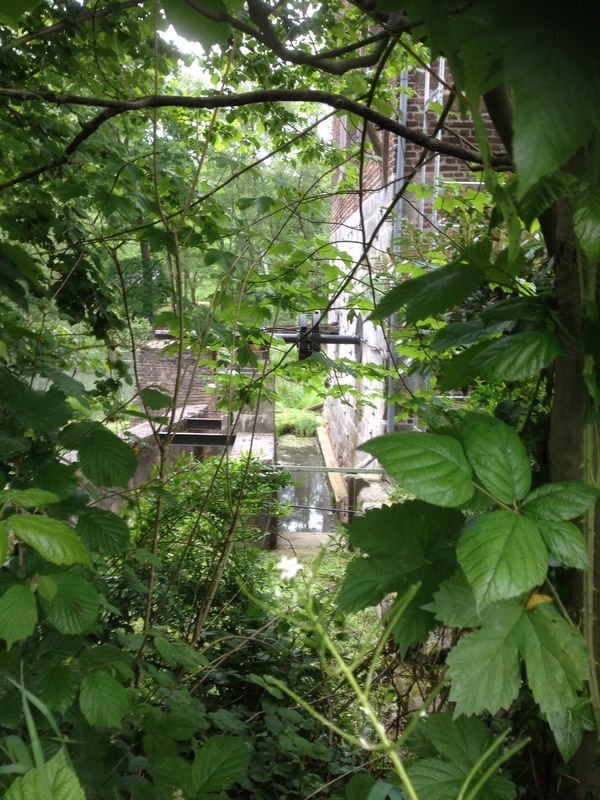 It was hard to get a view of the water wheel as everything was so overgrown. It had clearly previously been a really large restaurant. 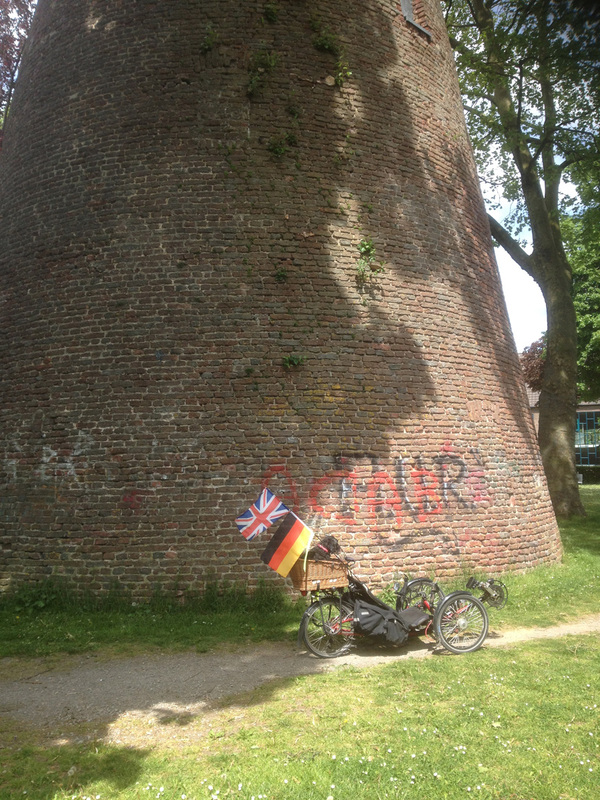 This was another ride with Klaus but with the unusual variation that he was riding an upright bike rather than his trike (which was off the road due to failed wheel bearings). It’s most odd riding with someone on an upright when you are used to triking with them – the speed profile is all wrong and it’s very difficult to chat. 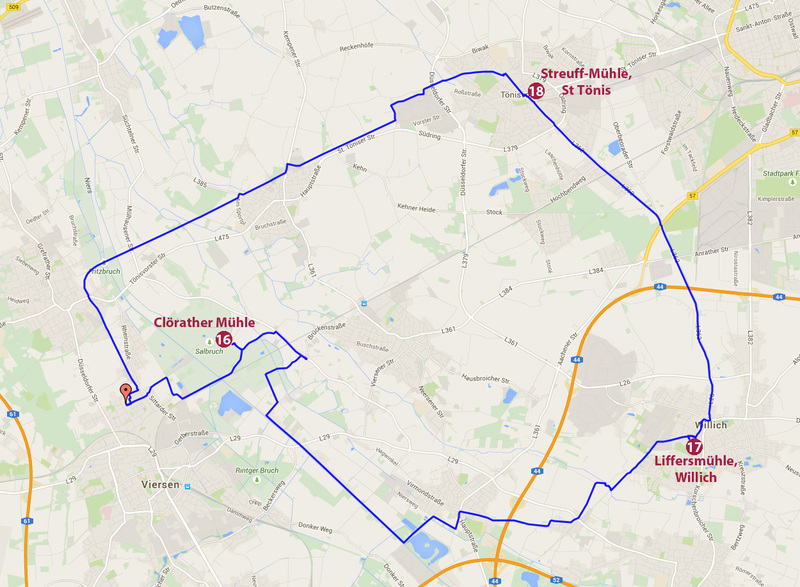 We also went a lot faster so this 57km round trip nearly killed me! This mill wasn’t actually on my list but I happened upon it due to cycling downhill (and therefore leaving Klaus behind) and I couldn’t hear his instruction to turn right. I had forgotten my Garmin so had no track to follow. Anyway, when I got to the bottom of the hill I saw the sign to ‘Pannenmühle’ and stopped. Klaus appeared shortly afterwards and explained that I should have turned off. 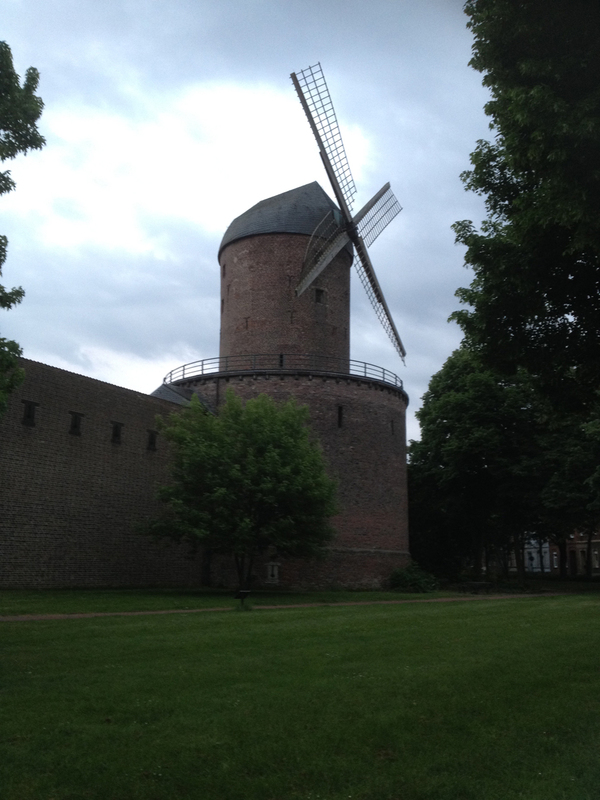 But conveniently we had happened upon another mill. 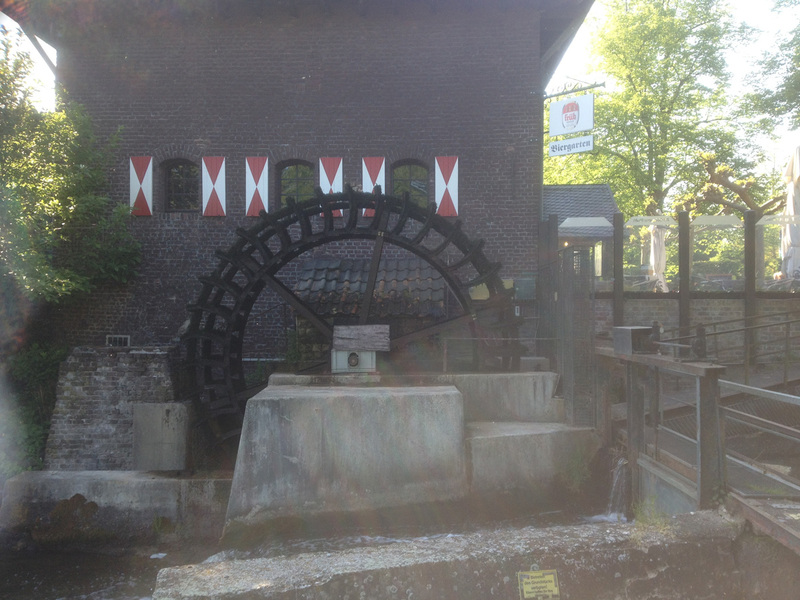 There was no way to get round the back to see the waterwheel and I have no idea if it is still functional but there were signs to ‘Pannenmühle’ (and not just the restaurant) so I think it counts. 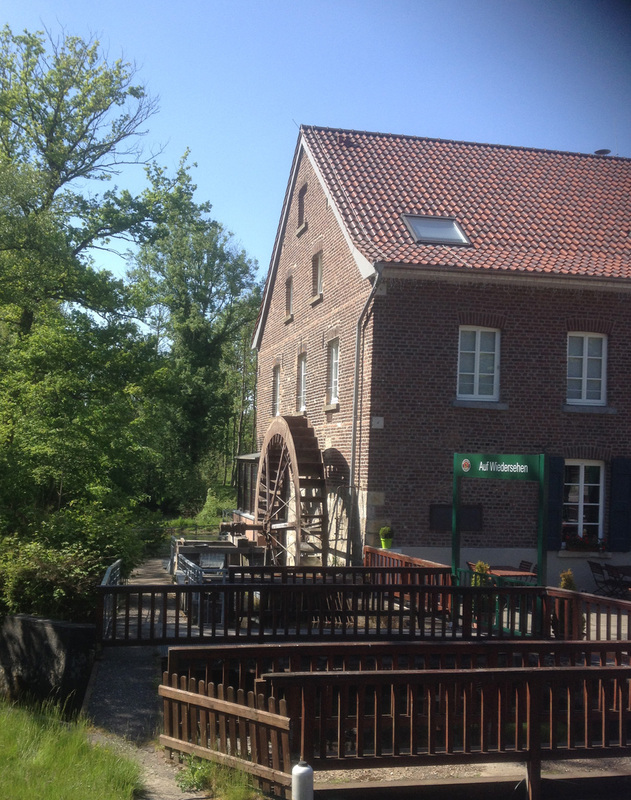 I then had the disadvantage of heading back up the hill en route the next mill – the Radermühle in Niederkrüchten – which we unfortunately overshot (we didn’t see it and Klaus’s iPhone didn’t have the waypoints for the mills, just the track). 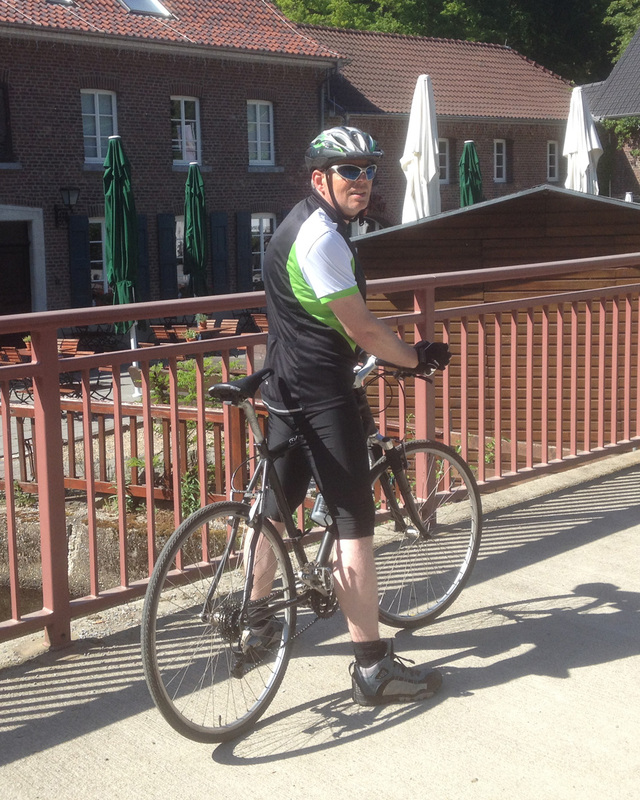 We only realised later so had to come back to bag the Radermühle on another ride. This was an absolutely lovely spot where we had a sit down for a few minutes. Photography was tricky because of the light but I think you can see what a lovely building this is. 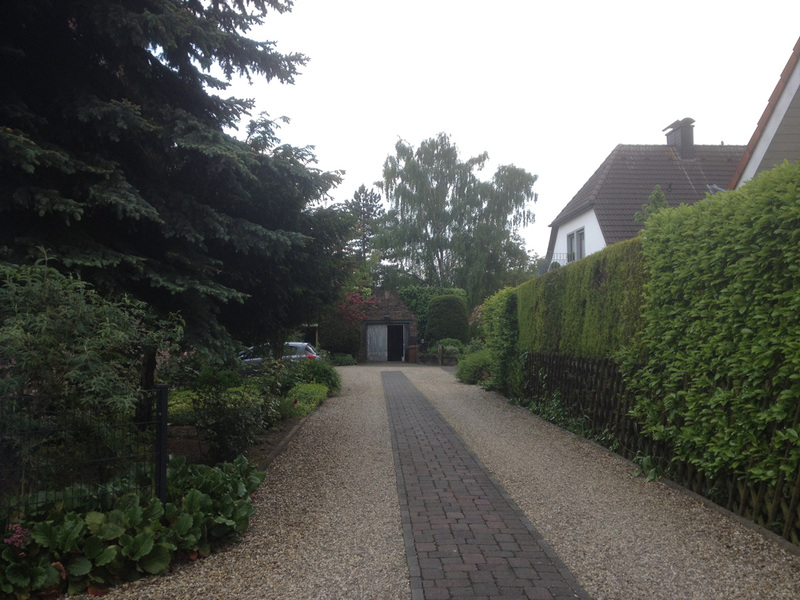 From the other side (when we first approached) it looked like a normal house – except for the millstone outside. This has now turned into a campsite and it was not allowed for me to explore behind the building to find the waterwheel. However we saw the millpond and various people sitting outside enjoying ice creams! 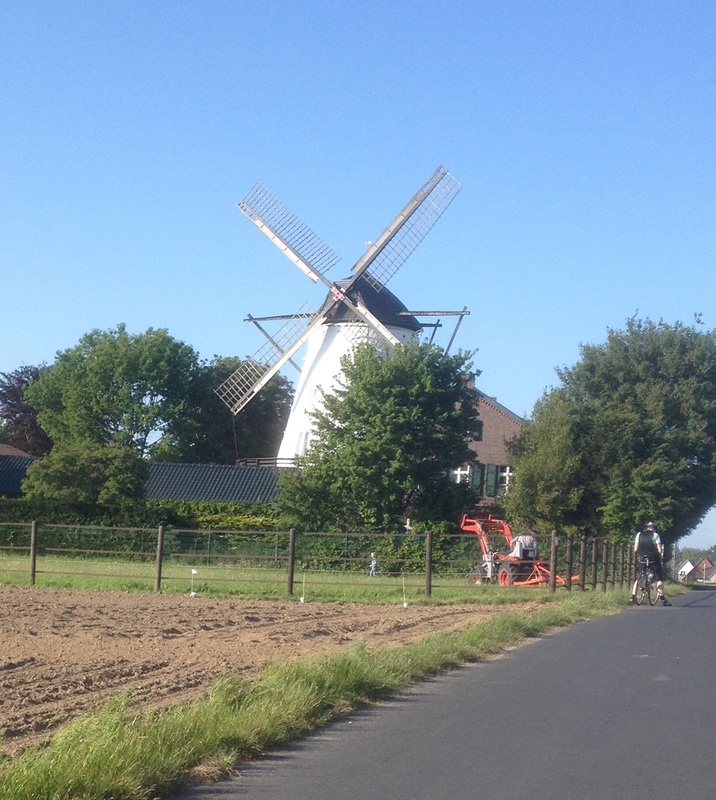 I’ve often cycled to Brüggen so have seen this mill many times before. 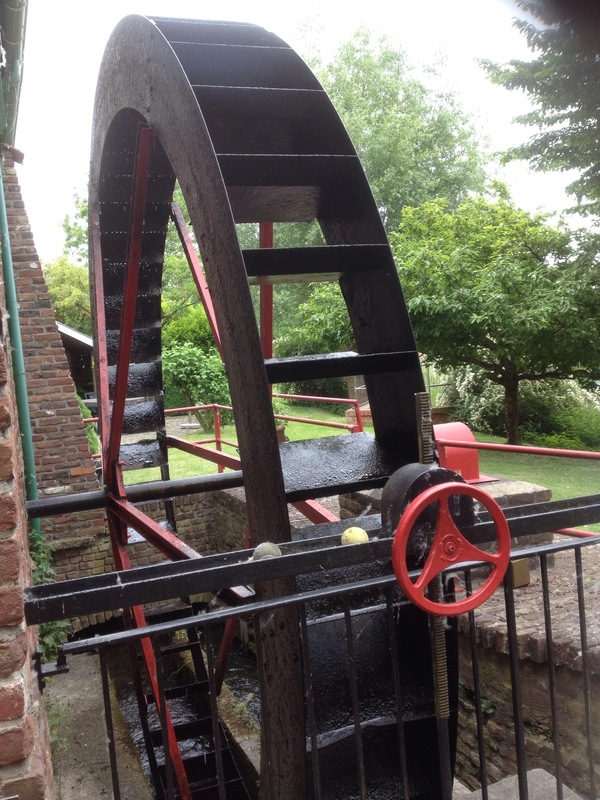 What is rather lovely is that the wheel still turns slowly… although I have no idea if it actually mills anything now. 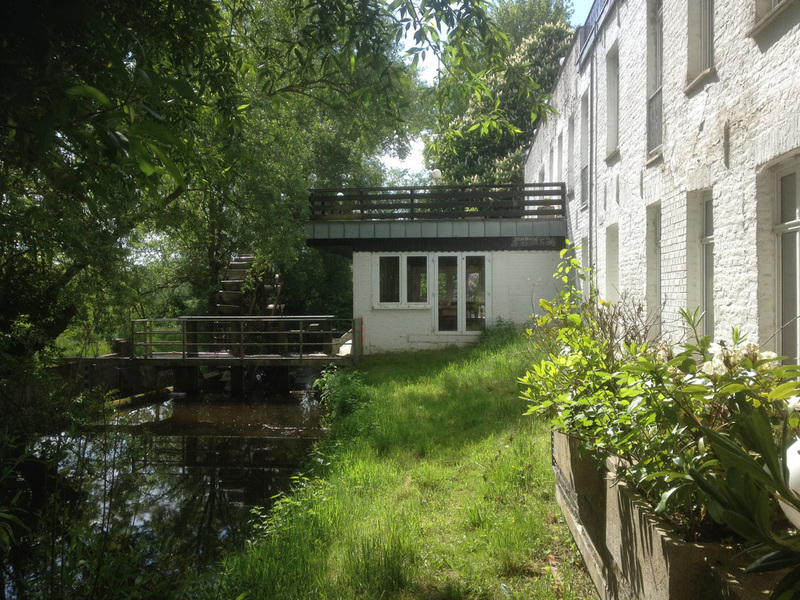 This is another mill that is now a private residential property. It must be difficult to get curved furniture to fit around the walls!! This was my normal Thursday evening ride with Klaus but as his Wild One was still off the road (the new wheels had not arrived) he would have to ride his upright bike again. Which meant I would be horribly slow on Alfie… so I decided to use Penelope instead. This meant I had to ride to his house (19km), do the ride with him and then ride home again (another 19km) so would end up a reasonable distance for me but why not, cycling is fun! After a cup of tea at Klaus’s House we set off for our mill-bagging, him on his Stevens race bike, me in Penelope. This was our route. 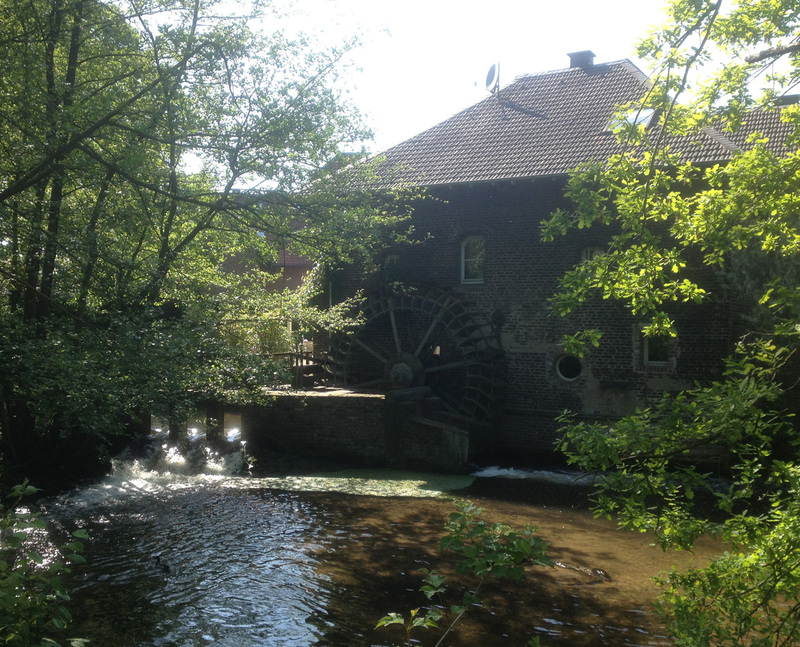 We stopped off at the Clörather Mühle, although there wasn’t very much to see. 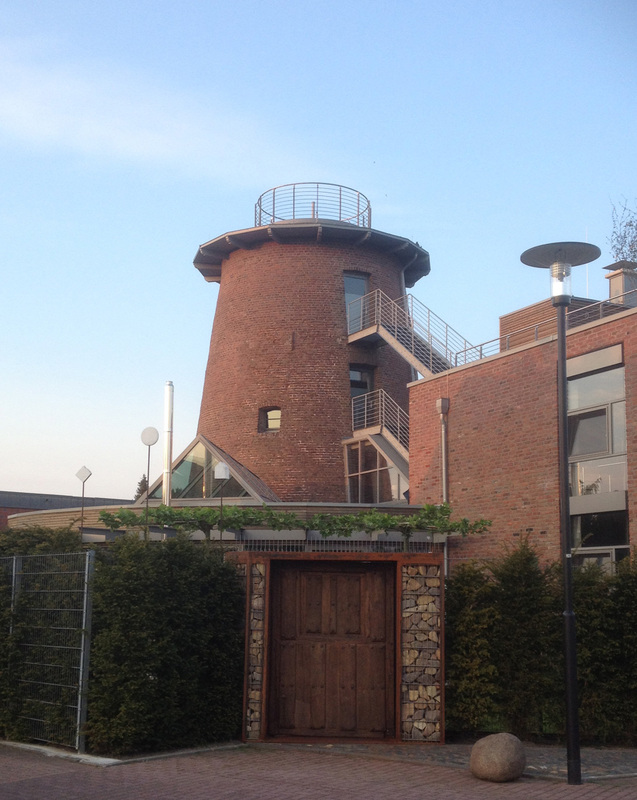 Die Clörather Mühle ist eine ehemalige Wassermühle in der Nähe von Viersen am Niederrhein. Sie lag bis zur Begradigung des Flusses an der Niers und gehörte ehemals zum zerstörten Haus Clörath. 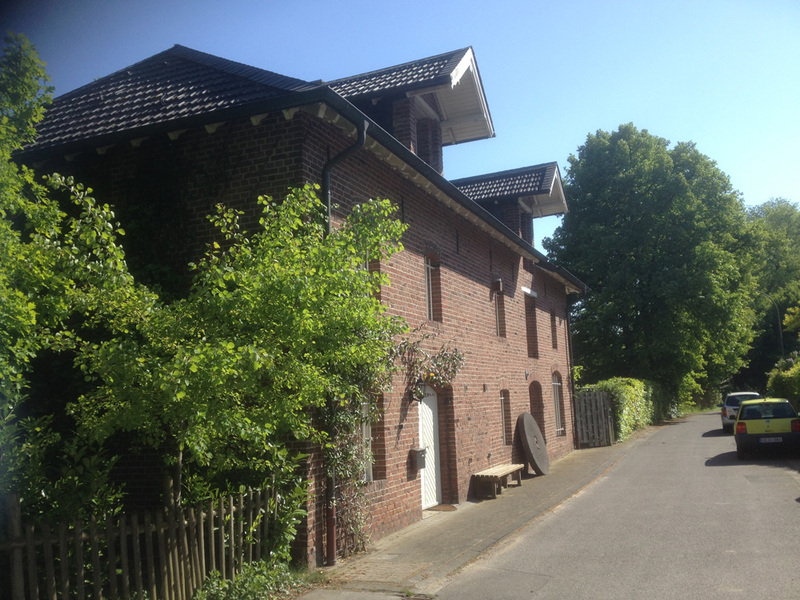 The Clörather Mühle is a former watermill near Viersen in the Niederrhein. 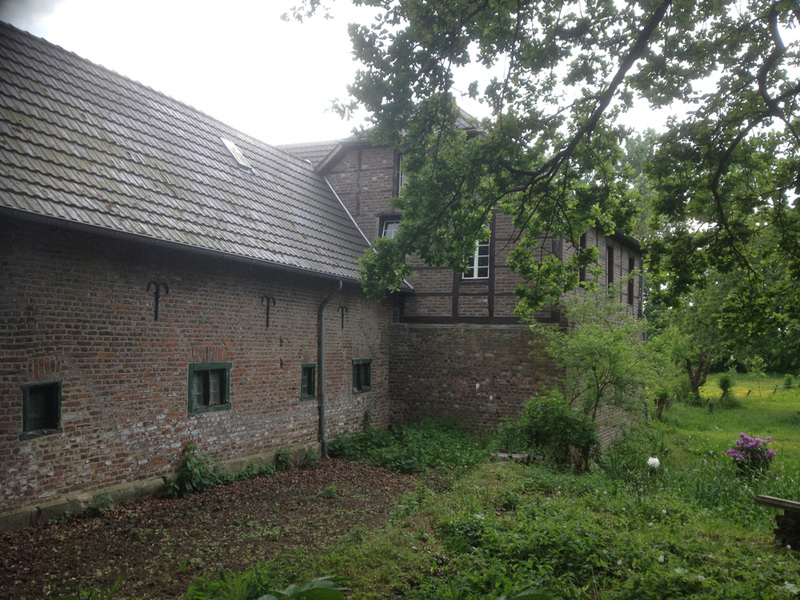 It was positioned on the Niers before the straightening of the river and belonged previously to the now-destroyed House Clörath. The straightening of the Niers is a bit of a disaster in a lot of ways – and has apparently changed the landscape around here. 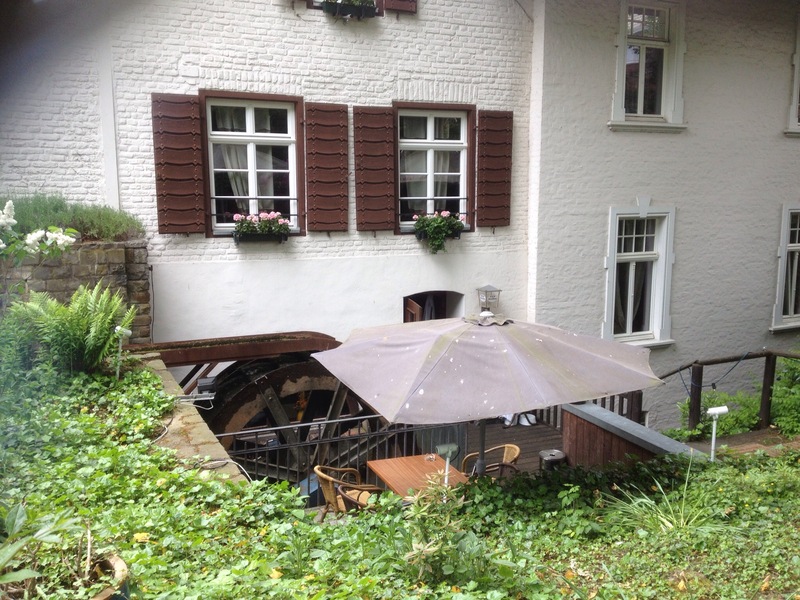 It left the Clörather Mühle high and dry as well. We knew this one would be tricky to find as the website said it was just a stump remaining in the ground. 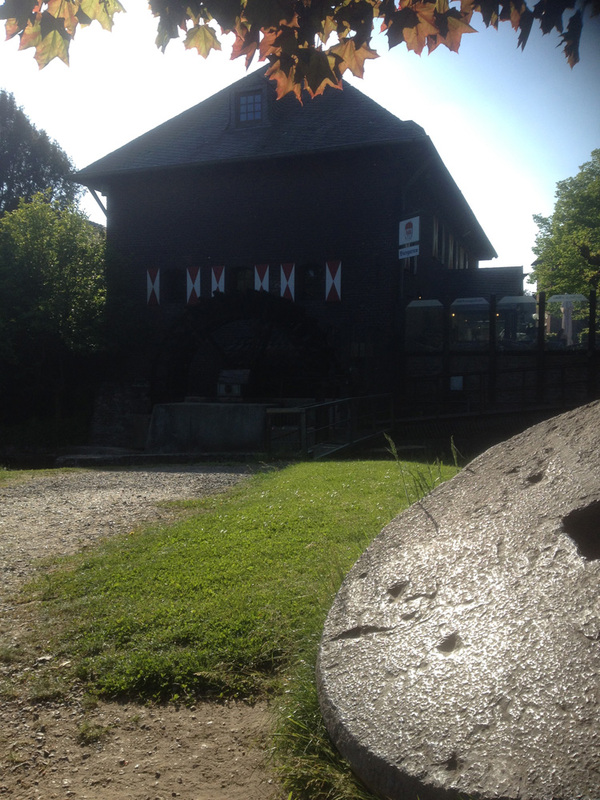 Information about it is found on this website: Liffersmühle Denkmal. We had the location on my Garmin and Klaus’s phone but when we reached the general area it was clear that it was not accessible. It was down a private drive so we had no joy visiting it. 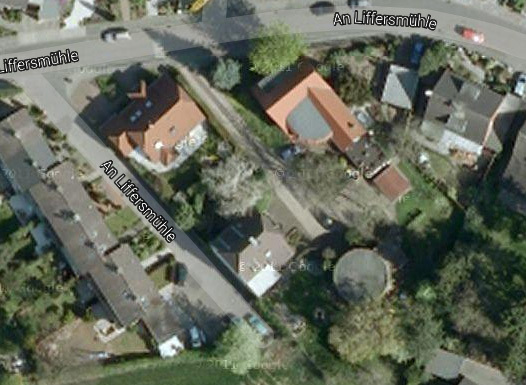 And here is the Google satellite view – you can see the mill stump at the bottom right hand of this screenshot. So we saw this mill from afar (it’s the thing covered in vegetation in my photo above) but got as close as possible without trespassing. So I count that as ‘bagged’. 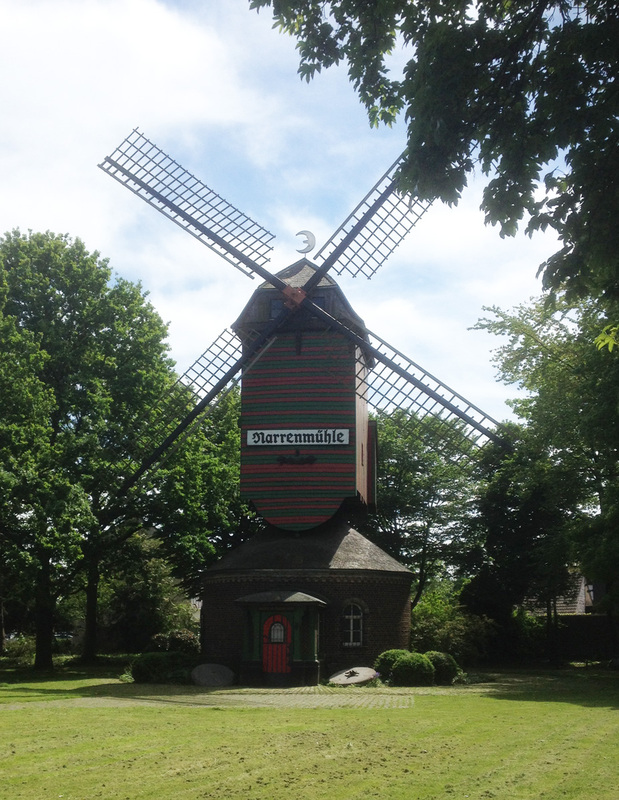 I’ve ridden past this mill a number of times as it’s pretty much in the centre of St Tönis (also known as Tönisvorst). We stopped for food in a pizzeria before carrying on to the mill, arriving just as dusk was approaching. 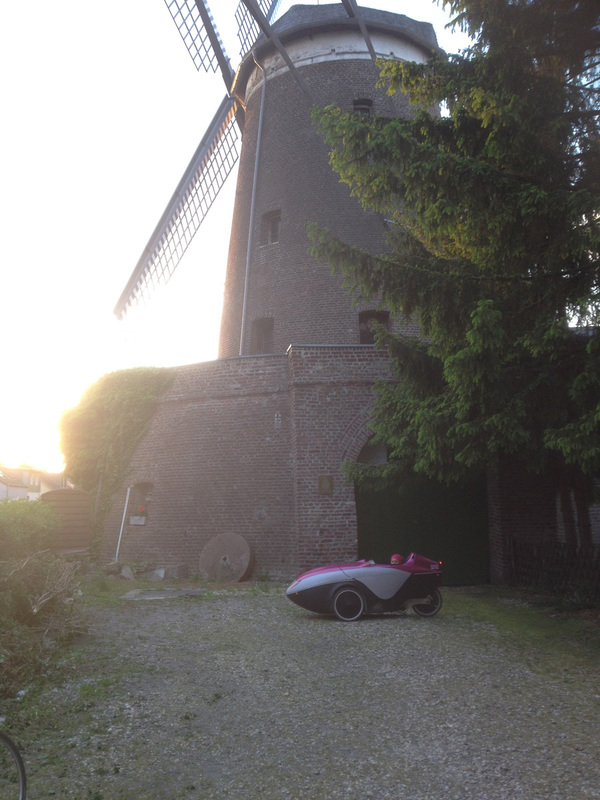 Here am I with Penelope in front of the mill. I was lazy and got Klaus to take the photos. 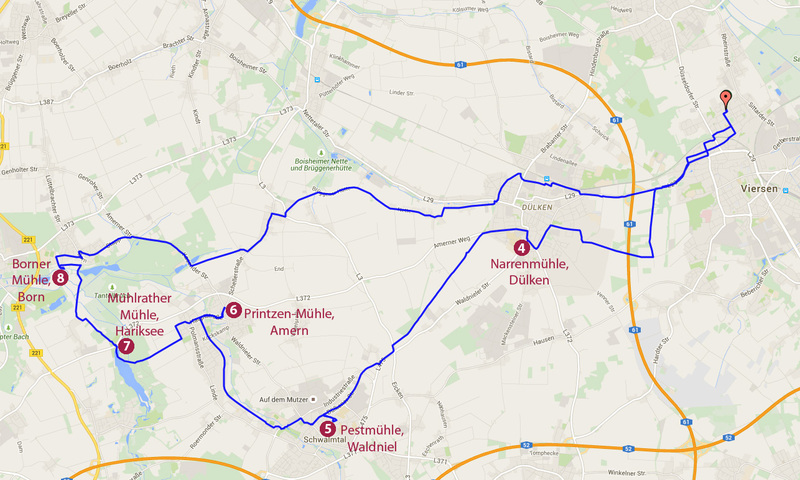 We zoomed back along the Bahnradweg from St Tönis to Süchteln and in fact our overall speed on this ride was a very respectable (for us) 21.4km/h average. I’m faster in Penelope and Klaus (who is faster than me on the trikes) was able to keep up on his race bike too. This was another ride with Klaus on his upright bike and me on Alfie. We had a fairly short time window so we had to ride quickly and without a cake stop. Shocking! This mill is just around the corner from the Volkshochschule where I have my German lessons but I had not previously noticed it. The Mill is now a restaurant but it was closed when we were there. 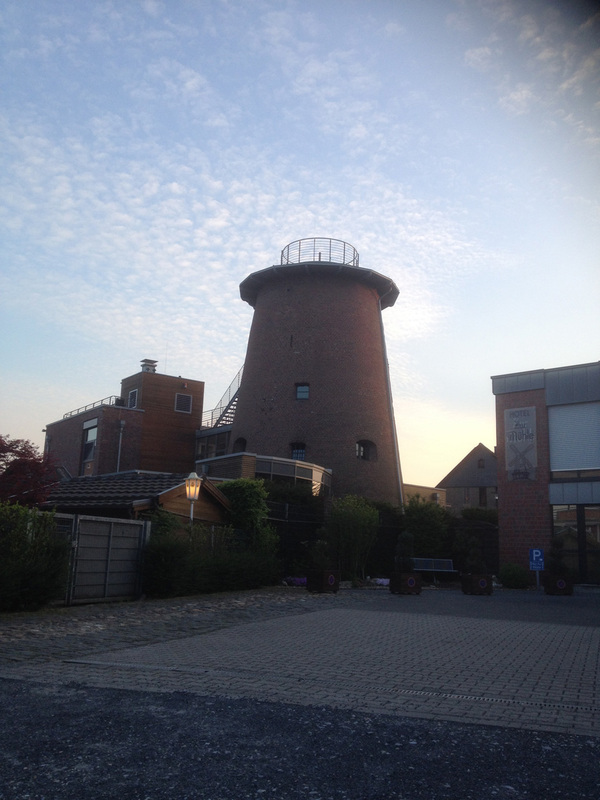 This mill was the other side of Viersen, right next to the out-of-town shopping area with DIY shops and McDonalds. 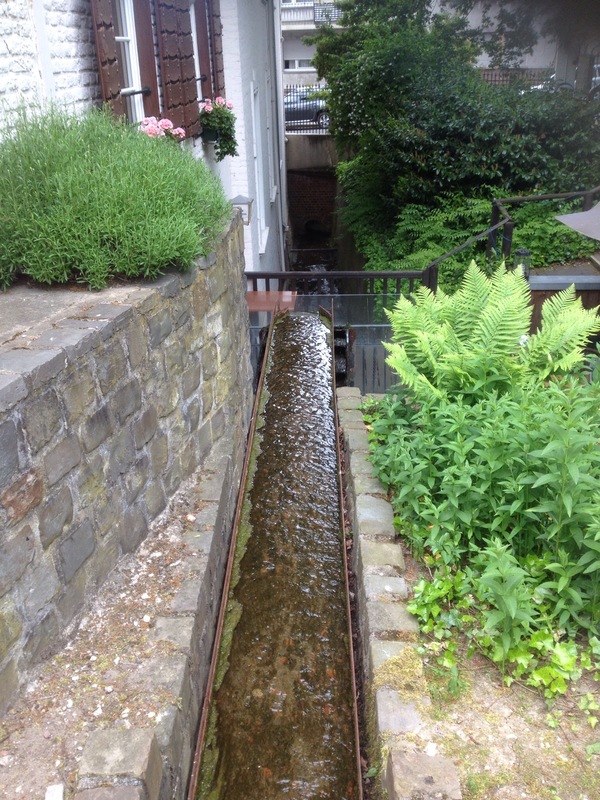 There is a small side road and then the mill – quite a surprise! 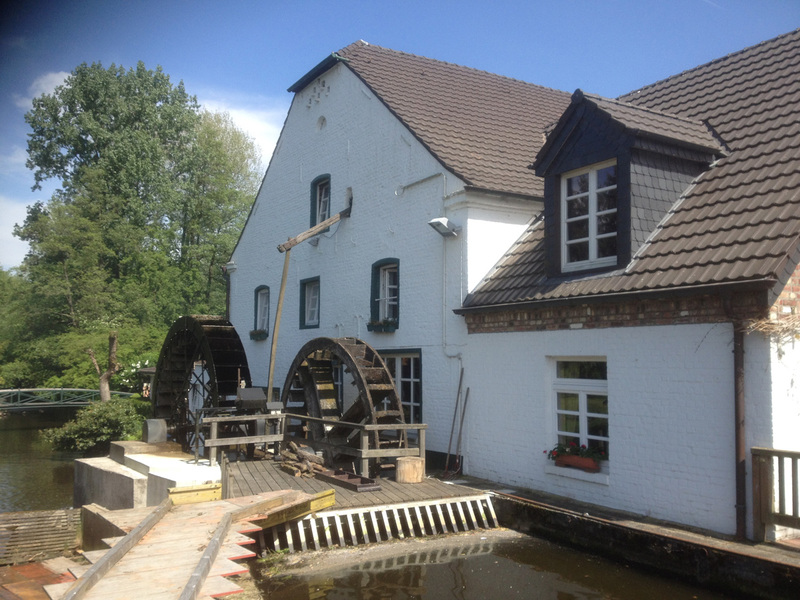 This was the mill that we had cycled straight past without realising where we were, so it was time to visit it again, south of Waldniel in Lüttelforst. 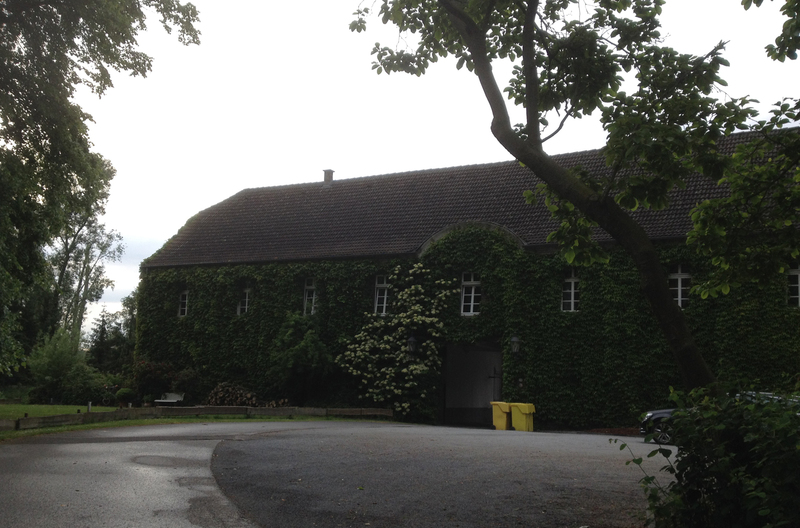 As we arrived I recognised it – and remembered saying to Klaus “there’s a sign here for a Mühle” but we had carried on. Oh well, we were there now although there wasn’t very much to see really. 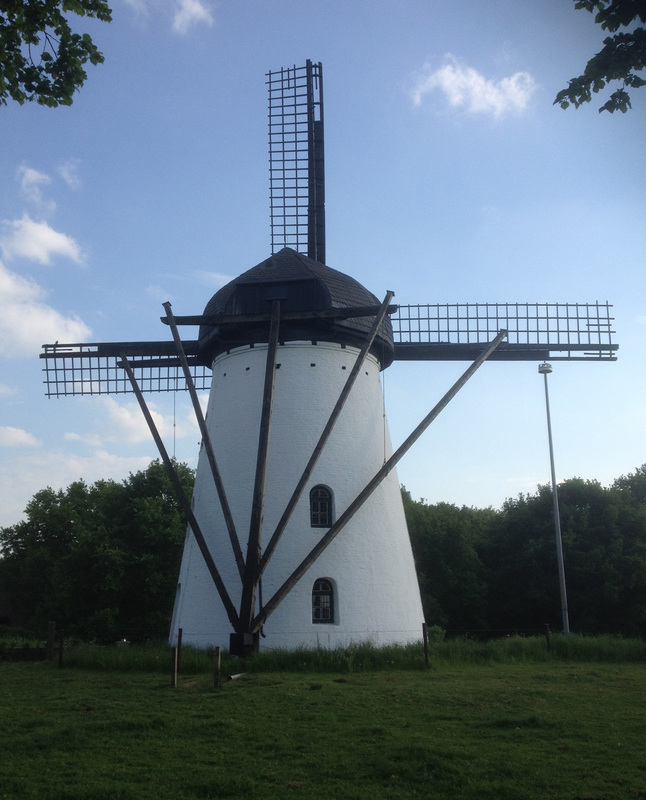 Anyway, it was mill number 21 ticked off the list, with only another five to go (Neersdommer Mühle, Kempen, St Hubert, Tönisberg and Boisheim). 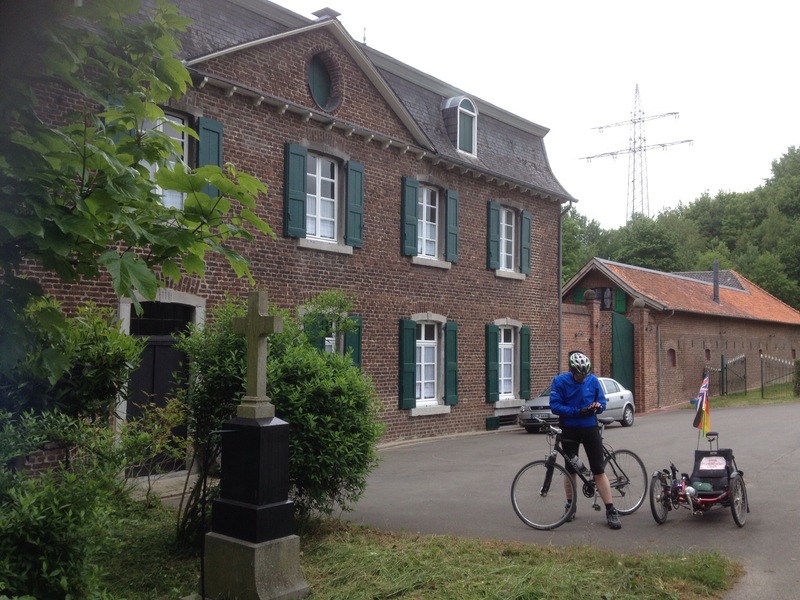 We actually cycled back via Boisheim but not near enough to the mill to bag it, plus we were short of time, so that will be another day. With only five more mills to visit and four more days in May I decided it would be good to try to complete all the mills in May. So despite a rainy weather forecast, and a late start (Klaus had to work later than usual), our traditional Thursday evening ride was going to be a mill-bagger. 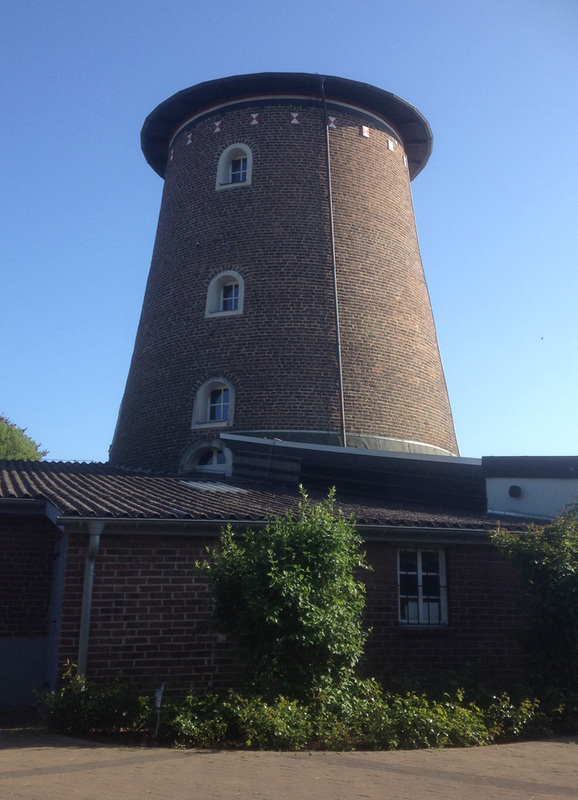 Three of the remaining five mills are round the corner from my house in Escheln (St Hubert, Tönisberg and Kempen), but of course part of my challenge was to visit all the mills starting at Klaus and Claudia’s house so what could have been completed in about 15km from my house ended up as a 54km ride. But very enjoyable! 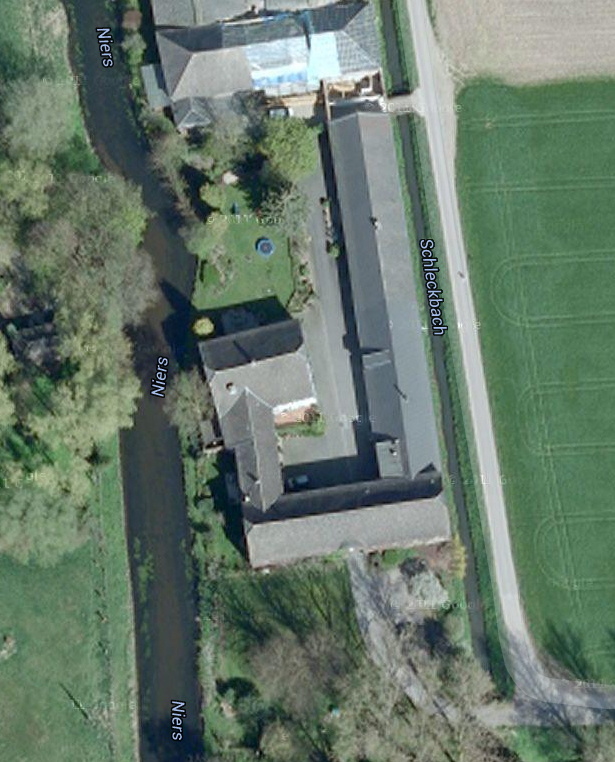 The Neersdommer Mühle was entirely unknown to me before I began to plan today’s route on the GPS software… and spotted it on the map! 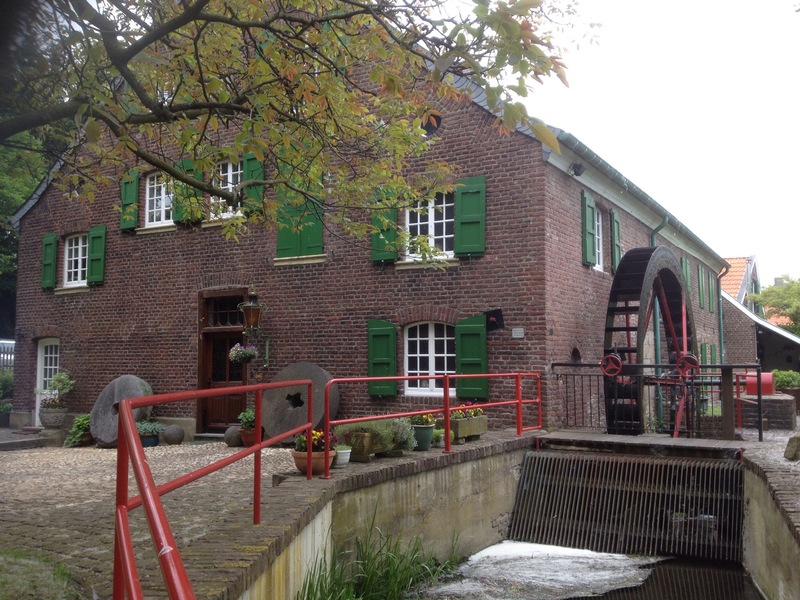 There are lots of places with ‘Mühle’ in the name but this one was beside the river Niers so had clearly been a watermill. I was very familiar with the building as it’s round the corner from Abtei Mariendonk, somewhere that I often cycle past. When we visited there wasn’t much to see though – just a very large building. I looked on Google Maps afterwards and it’s not possible to see if there’s a waterwheel still but I think not. I go past this mill once or twice per day – but had never actually been right up to it. It’s now a private dwelling so we didn’t hang around long, just for enough time for me to take this rather poor photograph. This mill is up the hill that I tend to avoid (due to laziness). I’ve visited it often though, and have usually been the only person there. This time there were also three cars with various young lads in so we didn’t stop for long – just enough time for me to take another poor photograph. 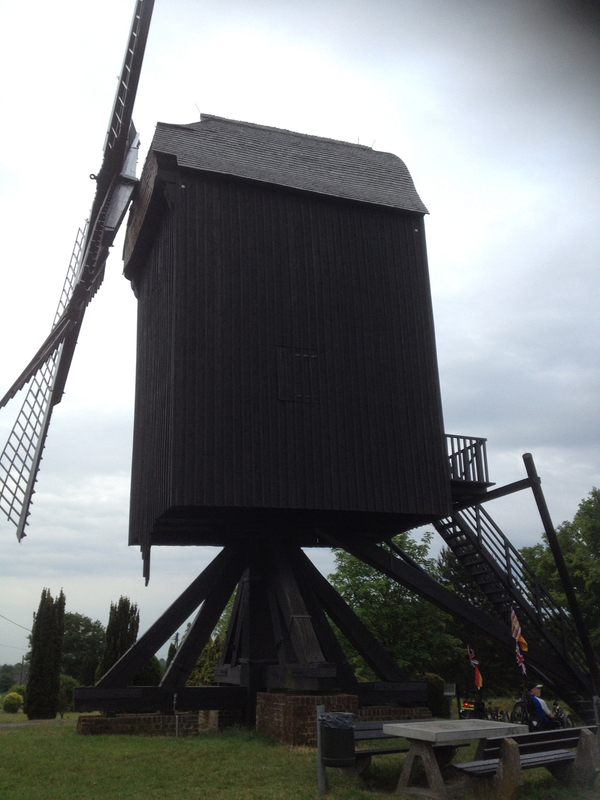 This is another windmill I regularly cycle past – but this is one I also visit on foot too. We stopped just briefly as I was starving (it was 21:30), so after a quick photo we went to find food. 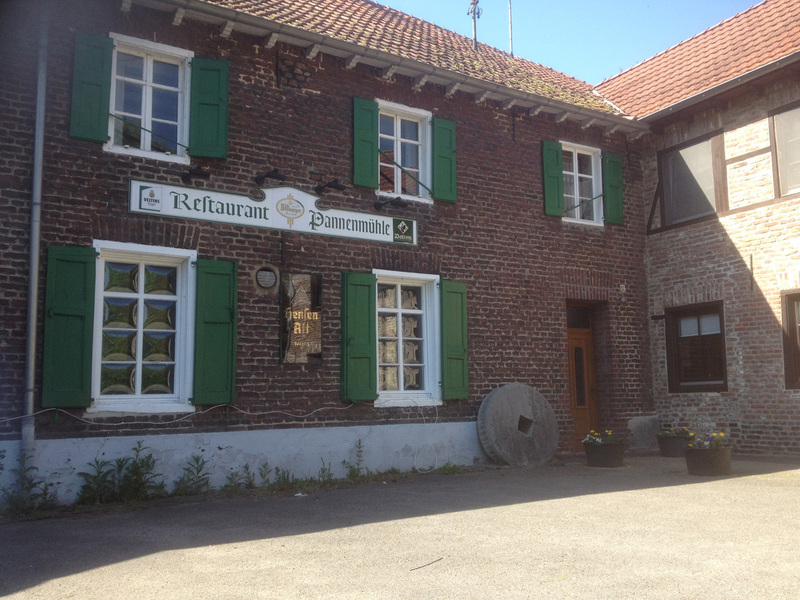 This left just one remaining mill on my list, the mill at Boisheim which I discovered when I cycled past it with Jochen. The last mill on the list, and all bagged within 16 days. Not bad! 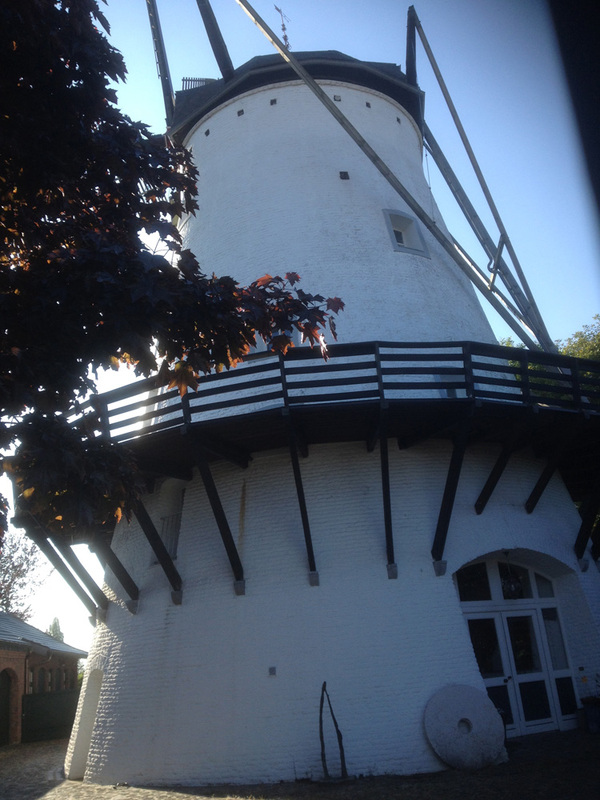 This mill-bagging was part of a 65km round trip to Kessel in NL and then back via Steyl. 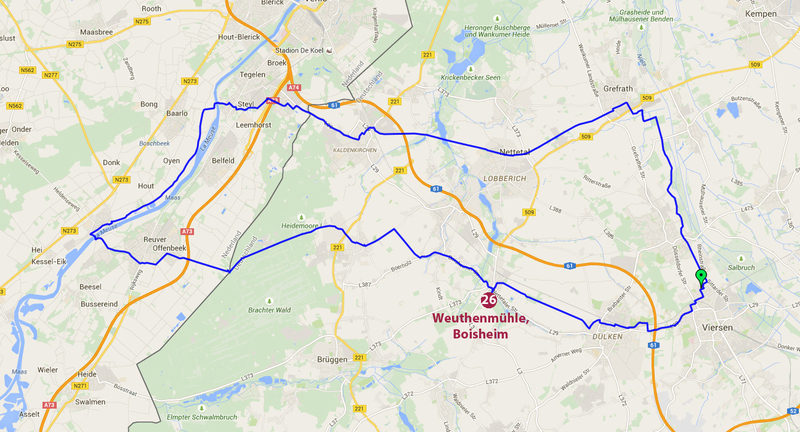 It was just a minor detour to head to Boisheim. 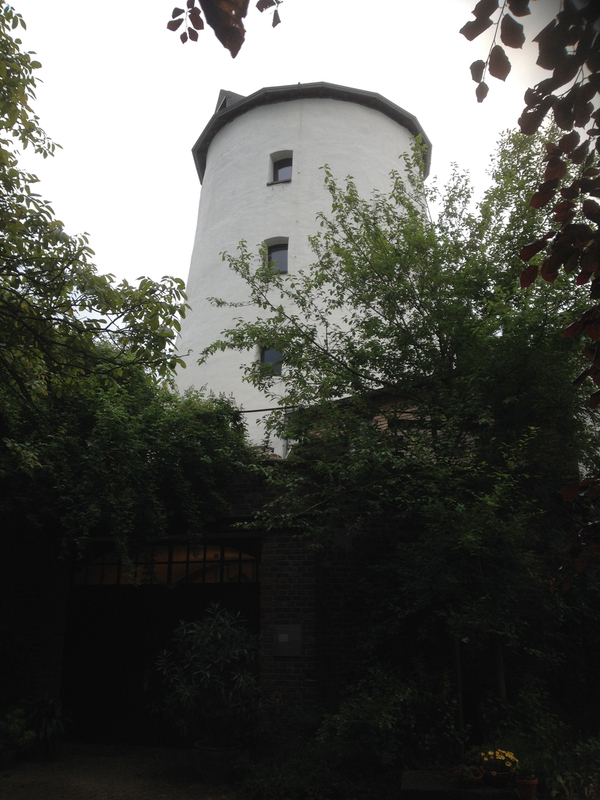 I hadn’t originally had this mill on my list but had cycled along the road ‘An der Weuthenmühle’ with Jochen and noticed the millstones outside the house… so it looked like it had to be a mill. I wasn’t 100% sure, when visiting it for this mill-bagging, what was actually the mill as there were several buildings. 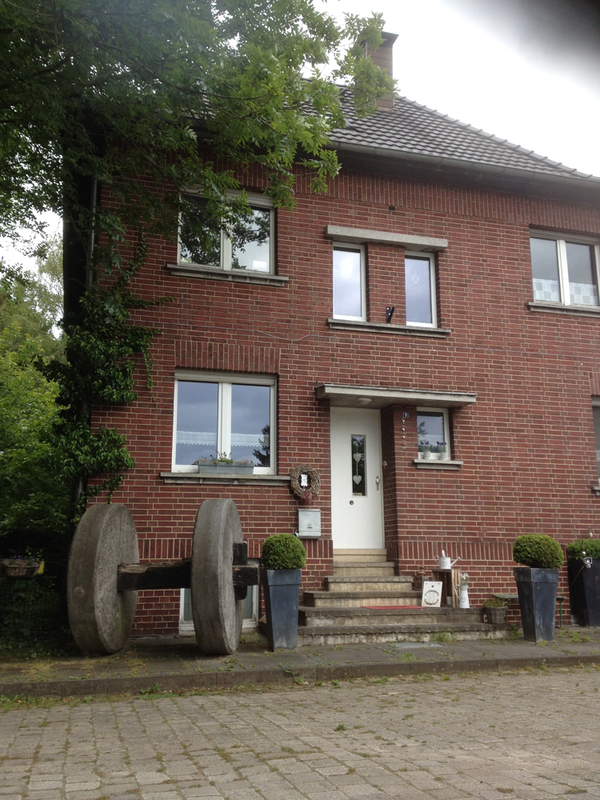 I photographed this house which was clearly too modern but had the millstones outside. It stopped functioning as a mill in 1960. 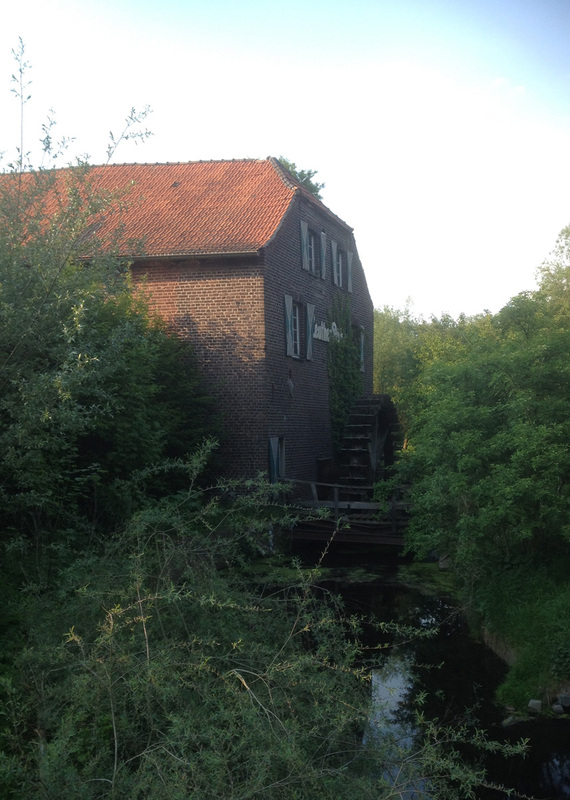 The photo I took was of the house but not the actual mill, which just looked to me like farm buildings! 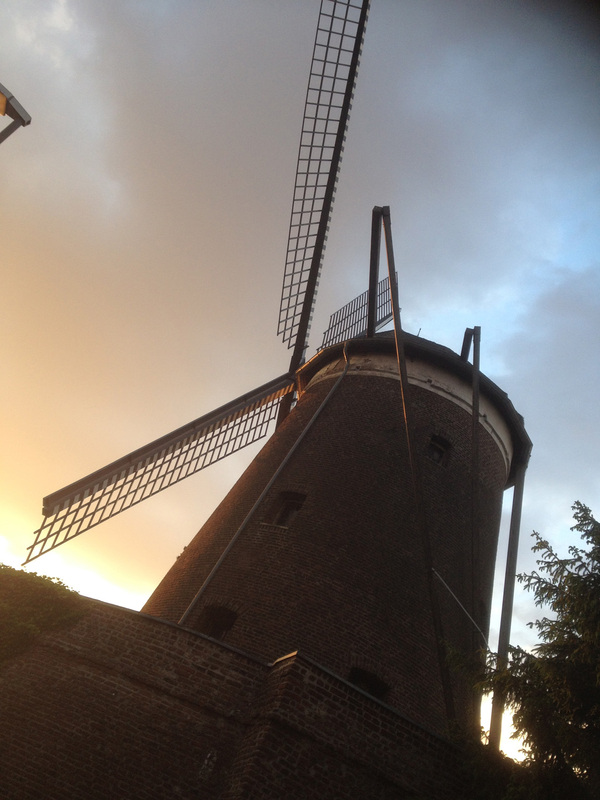 But the Wikipedia page gives this image for the actual mill. 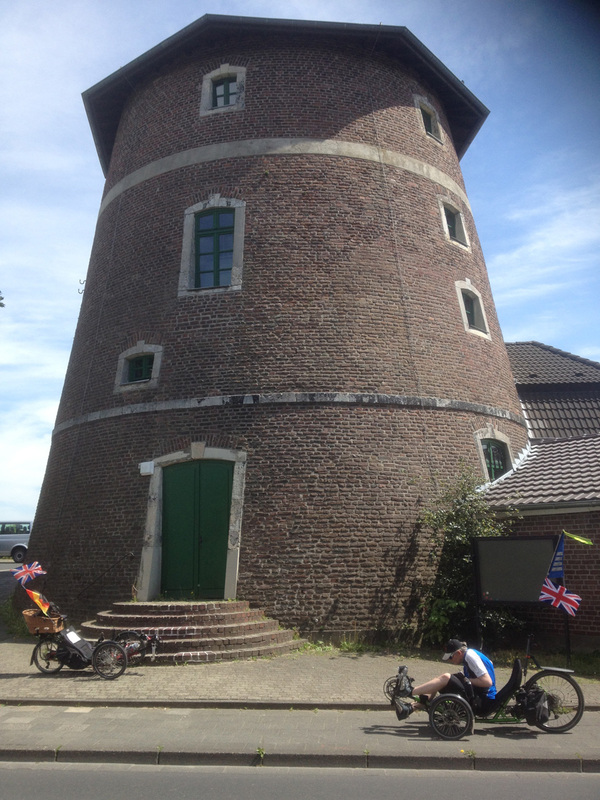 So that is all 26 wind and watermills in Kreis Viersen bagged within 16 days with a total of 339.5km cycled. Here’s a map of all of them. Thanks to Klaus, Claudia and Lara for their company during this little challenge, even if they might not quite have understood why the heck I was doing it! 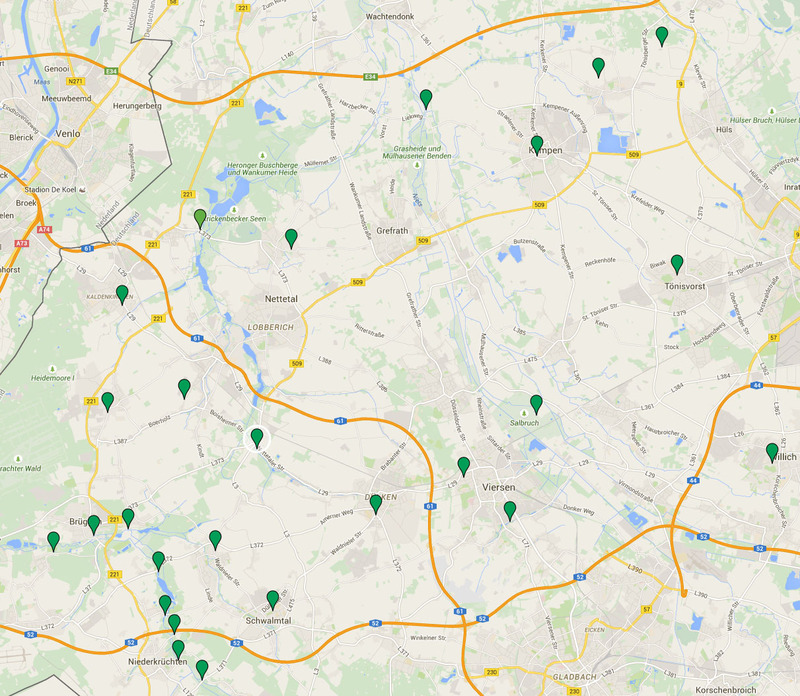 My next challenge, to start in June, is to visit all the Knotenpunkte in Kreis Viersen (there are 120 of them). But I won’t be blogging about them, but it may explain some crazy route choices over the next four weeks or so! Receive email notifications of new posts. Your email address will not be shared with anyone else. 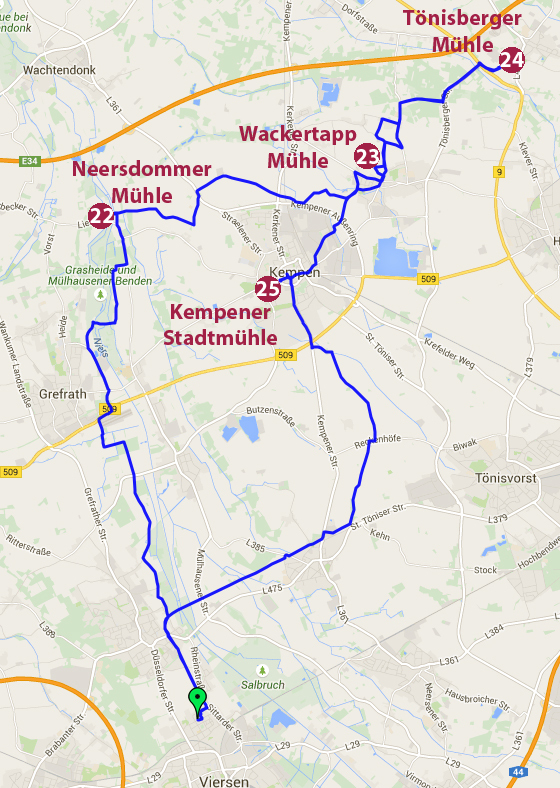 I’m a keen cyclist now living in Germany, in the Niederrhein area which is ideal for cycling. I have two velomobiles, a Milan and a Versatile. I also have an ICE Sprint trike. I previously also owned another Versatile and a Quattrovelo. I live with my partner Klaus whom I met through this blog. He also has two velomobiles, a Quattrovelo and a Strada. We also share our home with our dog, Poppy. 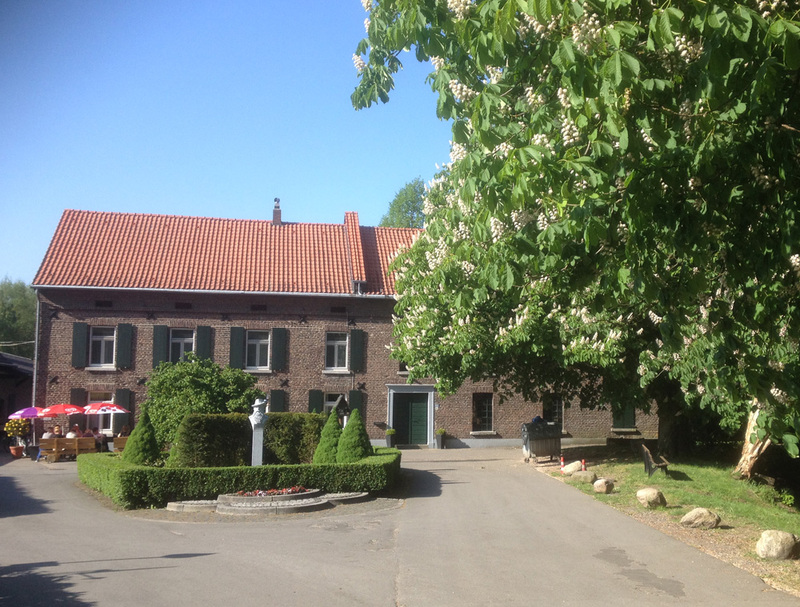 In between cycling and eating German cake I work at a food ingredients company in Kempen.